Princess Polish is back in action after a brief break for finals. I am SOOOO glad that is OVER! 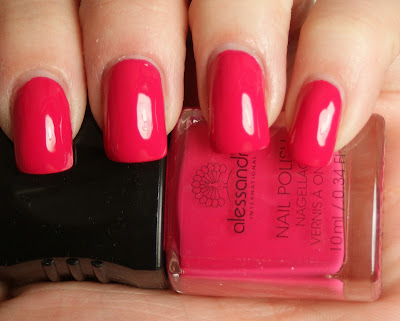 Today, I have a polish from a European brand called Alessandro to share with you! Alessandro wasn't available in the US until very recently, so us Yanks couldn't get our hands on it. Now, Alessandro is available here and it is pretty exciting!!! I was sent Bubble Gum to review, which is a bright pink creme. I'd venture to call it hot pink, in fact! The application on this shade was great! I used two thin coats to achieve full opacity, but could have probably done with one slightly thicker coat. It's also a little hard to tell from the photos, but the bottle is square and has an indentation for your finger that makes the bottle much easier to hold. LOVE IT. Here is Bubble Gum in the sunlight. Here is Bubble Gum in the shade. It has a little more of a reddish, coral look in the shade and inside. Alessandro polishes can be purchased at alessandro-international.us, for $12 each. I think that's a little on the pricy side for creme shades like this, which aren't terribly unique. But for some more of the interesting and unique shades, it would be worth it to me. So what do you think of Alessandro coming to the US?